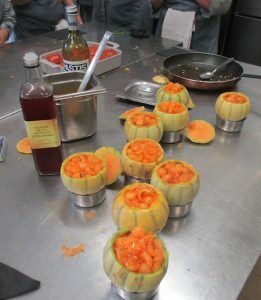 Here you can sample A Week In Provence by viewing one of my itineraries. Discover all the opportunities you will have by touring with Your Private Provence. No itinerary is the same. Every tour is customized and designed according to your preferences. While this itinerary entails bike rides and trail walking it can easily be adapted for those whose physical capacity doesn’t permit such activities. Pick-up at either Marseille Provence Airport or Avignon TGV Train Station. 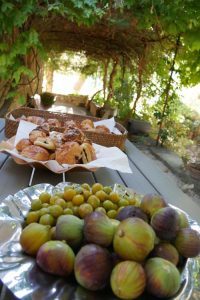 A Week In Provence means you’ll wake up every day to French pastries, local fresh fruit and French coffee. Fontaine de Vaucluse – scenic walk through the village to the mysterious water source. Local history museum (option), ancient paper mill and a mysterious legend of a “she-snake monster” will enchant you in this unique place. Lunch by the river. Gordes will be our stop in the afternoon. Enjoy a guided tour by Emily through the cobblestone lanes and the historical anecdotes that fashioned the village. A Week In Provence means you’ll enjoy sights, smells and tastes through multiple regions. 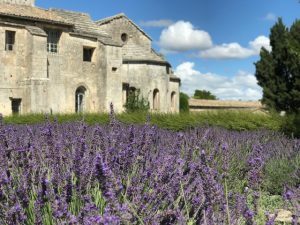 Scenic drive through the ochre lands (known as the Provencal Colorado) to the heart of Provence’s lavender growing region. Historic walk through the village Sault with lunch at bistro looking over the valley. A 30-minute drive to a winery producing Côtes du Ventoux wines. Tour includes a 45-minute visit of the winery and a 45 minutes wine and olive oil tasting experience. On our way back (this day tour makes a loop) we will stop to stroll through Venasque, rated as “One of the Most Beautiful Villages”. 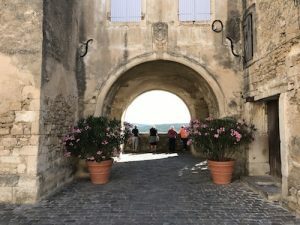 Luberon perched villages: Lacoste, Menerbes, Oppede-le-Vieux – by bike! Join me for a bike adventure that you’ll dream of for years to come. Even if you are physically fit you will probably enjoy these electric bikes as the villages are separated by valleys. While on our bike tour, we will visit a winery, castle ruins and have lunch at one of my favorite lunch stops. If you don’t want to venture on the bikes, the tour can be done by car. Catered dinner at your villa if you have opted for a villa rental or dinner outing at a local village restaurant. We will venture a little farther from the villa and the Luberon area to discover an area that became famous with the works of Vincent Van Gogh. St Remy de Provence will charm you with its pedestrian streets encircled by the remnants of its 14th-century wall. Today is also market day so you will have the morning to do any shopping you wish. Lunch on your own with my guided advice on restaurants. A short scenic drive over the Luberon Mountain Chain to visit the charming village, Lourmarin, rated as “One of the Most Beautiful” villages in France. Historical walking tour and visit of Chateau. Lunch on your own in the village. We will continue on to my hometown where we will visit a Provencal Jewish Synagogue (unique in the world) and the beautiful cathedral where I got married. 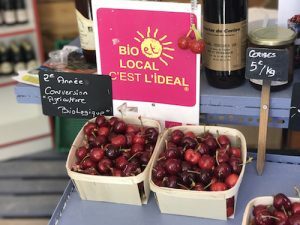 A gourmet experience awaits you in my hometown with a visit at the local farmer’s market and then on to Michelin rated restaurant with our produce to prep our evening meal with the chef. A Week In Provence wouldn’t be complete without visiting a few of the UNESCO World Heritage Sites. Orange’s Roman Antique Theater and Avignon’s Palace of the Popes. We will also venture into the renowned wine region, Chateauneuf-du-Pape. An hour’s drive North will take us to a large theatre of Imperial Rome listed as a UNESCO World Heritage Site. From here we will venture down into the renowned wine region, Chateauneuf-du-Pape. For those who wish, the vineyards can be discovered by bike (VTC or electric)– a moderate 1,5-hour loop to discover the different terroirs producing this fine wine. Lunch in the village Chateauneuf-du-Pape. Last, but not least – Avignon! Here you will stand in awe in front of the biggest Gothic palace in the world and the legendary Pont d’Avignon. After a historical walk through the city, we will celebrate our week together at a lovely restaurant next to the magnificent Popes Palace.